A co-signer agreement is used to supplement a lease agreement between a landlord and tenant. Specifically, in circumstances where the tenant's credit or references are not satisfactory, this document names a third party (the co-signer) who agrees to take responsbility for any financial or other breaches of the lease by the tenant. The Tenant is the person who is occupying the leased premises. 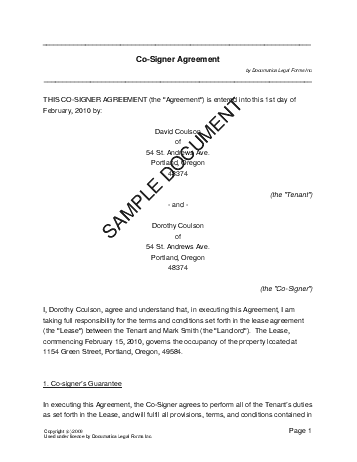 The Co-Signer is the one agreeing to help the Tenant meet the obligations of the lease. Do you wish to specify a suite number? We strongly recommend obtaining an attorney reviewed Co-Signer Agreement directly from us. Below are some random samples we have created with Documatica. Please note that these documents reflect a certain set of answers, and it is very likely that the document you require is different. Do not rely on the templates below - create your own customized Co-Signer Agreement with our webpage. For maximum legal protection, obtain a lawyer reviewed Co-Signer Agreement directly from us.